Like many of you, I have experienced having a clogged dishwasher. It’s frustrating, right? You know what is even more depressing? When help is not available right away. While others may opt to contact a plumber as soon as possible, I suggest that you try to resolve the issue on your own. With this, in the rest of this post, I’ll share more on how to unclog a dishwasher on your own. While there is nothing wrong about asking help from a plumber, more often than not, this is going to be expensive. Also, there are many instances wherein a plumber is not available right away. Would you wait long when there is something that you can do to address the problem? Many are possibly intimidated to unclog their dishwashers, thinking that it is a complicated task. With basic knowledge and the materials required, however, you can do it easier. Keep on reading the rest of this post and we’ll let you know exactly how this can be done. There are different ways by which is will be possible to unclog a dishwasher. Generally speaking, however, here are some of the materials that you will need to follow the steps that will be mentioned in the next part of this post. Before anything else, you should first check the hose for blockage. If there are debris that blocks the hose, this is an indication that this is the problem. First, remove the back panel of the dishwasher. This will expose the internal components of the dishwasher, including the hose. Once you have removed the panel, take out the hose from its position. The exact location of the hose will depend on the specific model of the dishwasher that you have. You might also want to consult with the owner’s manual to see which one exactly is the hose. Using a stick, poke the center of the hose. If it gets stuck, this goes to show that there is indeed a blockage. From here, you already know where to start resolving the problem. Different people might have different ways of unclogging the hose of their dishwasher. Here is one of the simplest tricks that I am sure will work. I have personally tried this is the past, which is why I can personally attest to its effectiveness. Before everything else, clean the dishwasher and make sure that it is empty. Take of everything, including the racks. It will also help if you can clean the latter, making sure that they won’t contribute to any blockage in the future. You should also take out the stagnant water inside the dishwasher. You can do this by patting the surface with towel until water is completely eliminated. This will also avoid it to spill and will prevent slipping as you proceed with the task. Now that it is clean, locate the hose. Again, as it has been earlier pointed out, the location may vary depending on the specific model of the dishwasher that you are using. Perfrom a physical inspection of the hose to know the problem. If the hose is crumpled or creased, this is an indication that it is already problematic. Remove it using a screw and replace with a new hose. If there are particles blocking the hose, the goal is to take it out. In this case, straighten a metal hanger. Bend the flat end and insert it on the hose. Make sure that it is long enough to reach exactly where the blockage is. You might also need to take off the draining basket. All that you have to do is to unscrew it. Drain the clog in the basket and clean it using warm water so that it can be unclogged. Run the dishwasher once all parts have been returned to their original place. If it is now working properly, congratulations, you we able to do the task successfully! Aside from using a hanger, here is another solution that can prove to be equally effective in unclogging the hose of your dishwasher. By this time, I would want to assume that you have already removed the hose from its place. All that you have to do is to position it next to a faucet with running water supply. Turn on the faucet to full pressure so that it can exert more force. As water runs through the hose, this will be effective in pushing the debris out, which is one simple way to get rid of the clog. Finish by rinsing the hose properly, making sure that no remnants of blockage remain inside the hose. Pour warm water in the hose. Avoid using water that is boiling or too hot as this can possibly break the hose, especially if it is made from plastic. After the water, pour about half cup of baking soda and let it stay inside the hose for quite some time. After a few minutes, pour one cup of vinegar followed by warm water. Suspend the drain in an upside position and allow the mixture to stay in the hose for at least five minutes. Flush it with water and rinse the drain. By this time, the blockage will most probably be gone. 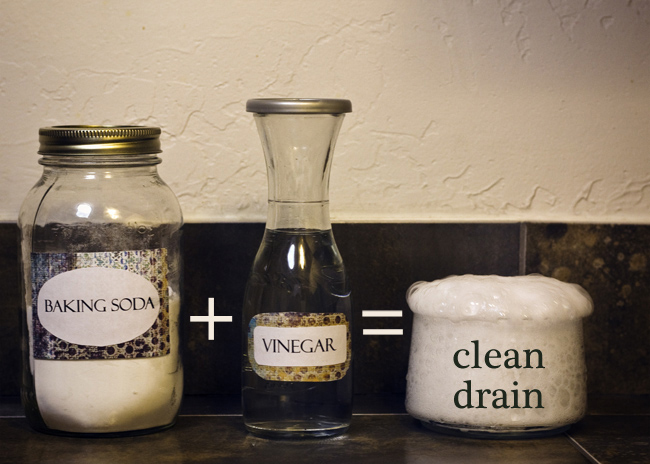 Baking soda, water, and vinegar can produce a one-of-a-kind chemical reaction that will be effective in softening grime. When it becomes softer, it will be easy to have it flushed out of the hose, even without the need to pull it out using a metal wire. Also, it is important to note that while the hose is often the part to be blamed, in some instances, it can also be filter. Located at the bottom part of your dishwasher, they should be cleaned at least twice a month so that they won’t cause the dishwasher to clog. To sum up the things that have been mentioned above, here is a short video clip that shows different ways by which you can possibly get rid of the debris that clogs your dishwasher. Aside from the steps that have been mentioned above, there are also tips that you have to keep in mind, including those that will be mentioned below. As they say, prevention is better than cure. With this, make sure that your dishwasher is regularly cleaned. This will avoid the possibility of clogging in the future. Always refer to the manual from the manufacturer, especially with regards to how you can remove the hose and the drain basket. See to it that they are properly installed before turning the dishwasher on. As a safety precaution, make sure that the unit is turned off and unplugged before you start with any of the procedures mentioned above. This might seem like a logical thing to do, but there are many people who forget to do so. Do pour boiling water in the hose, especially if the latter is made from plastic. This will cause it to be brittle, and in the end, it will break. If the solution is to replace the hose, look for one that is compatible with the dishwasher. If you are unsure, you can bring the old hose to the store where you are buying a new one, making it easy to make sure that you will buy one that is compatible. Some dishwashers are connected to the sink waste. In the case of the latter, if your dishwasher is clogging, you might also want to check the drain from the sink as this can possibly be the source of the problem. Always do things with caution. Do not be in haste. If you are careless, you will end up escalating the problem rather than solving it. This can lead to higher expenses, and worse, you might just break your dishwasher. If you have already tried the solutions mentioned above and nothing proved to be effective, this is a sign that you have to call a plumber. You will surely benefit from their expertise and experience. In sum, knowing how to unclog a dishwasher is important because it will allow you to save a lot. You do not have to call a plumber and pay for their professionals service when you can do it on your own. Additionally, if you know how to resolve the problem, you can address it immediately instead of waiting before a pro is available to fix the issue. Did you enjoy reading this post? Have you tried unclogging a dishwasher before? How did you do it? Do not hesitate to leave a comment below and share your insights to our readers.